Jon has a realy good tutorial on that mod, i think it looks a bit more well done ! and there is quite a few good hints and tips there ! Did it today too. I used M6 x 55 bolts and a #7 black stopper drilled with a 1/4 inch hole as another poster suggested. $4.48 in parts and 15 minutes to do it. Have not had it out for a ride yet, but even sitting on the bike there is a noticeable difference. Next I may attempt to drill the stock muffler baffle. Did it today except I used M6 x 60 bolts and a #7 black stopper drilled with a 1/4 inch hole as suggested. Just did the seat mod. Works like a charm. used M6 bolts x 50mm and about an inch worth of nylon spacers. very comfortable ride. What can brown do for you! thanks seat raise worked great for me..
Those look cool, Working in a metal fabrication shop I may try some stainless steel risers. How easy is it to get the seat off? New to the modifying business, but I'm getting ready to add hwy bars from a different bike too. One 10mm socket w/extension, one 5mm allen wrench (I think those are the right sizes, going off my slightly flawed memory here ), and about 1 minute of time. It's real simple, at least on my '08. 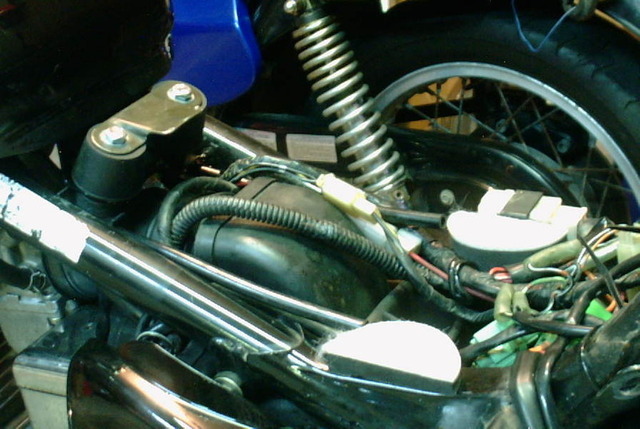 One allen head bolt at the rear of the seat, two 10mm bolts on either side about halfway up, then just pick up the rear of the seat; the front has a hook on the bottom of the seat pan that fits under the bracket that will get lifted up. Easy peasy! I was going to have a guy at work mill me up a taller aluminum bracket to replace the stock one, but just heard he got fired. Dangit! Oh, and here's a pic of my version of the mod, 1" nylon spacers, with longer bolts. Should've gone 2", but still have plans to make up some kinda complete replacement for the bracket. Anyone tried this with the later S40 one-piece seat? Yeah it still works, but you don't want to flex the seat too much. Shim the rubber support points with thicker shims the closer you get to the tank. I like the way the rubber supports have a sort of "tread" on the bottom and those plugs that stick into the seat pan. So I sliced them horizontally, added wooden shims and glued them back together. Actually, my post on the previous page was on an '08 S40 with the one piece. And as Boule'tard said, you probably wouldn't want to flex it too much, at least cold, although I suspect that if you can flex it enough without damage, eventually it would conform to that angle. Just did this yesterday with the #7 stoppers and the 6x50mm hex heads...WOW what a difference, and it took 3 minutes. I just tried this. #7 stoppers and M6x50 bolts. I can't believe the difference. I didn't think there would be much but for $5.00 I figured I would try. Now what about the supports in the middle? Do I need them? Is everyone using them? Thanks. Same question here. Mine's an '08 and it looks like there's a bunch of other support spots under there you would need to boost up, too, if you lift the front. I saw the earlier post stating it was done on an '08 but it doesn't seem like a great idea to leave the middle of the seat floating in the air. More than likely when you sit down it will even itself out. I used some rolled up bicycle inner tube on one spot to give it a little support. I don't make the rules, I just know what they are. 4. If one, two, or three doesn't work, refer to one again. On my '08, I cut up an old rubber bungee strap and used silicone to glue it to the frame. The middle of the seat rests on the straps. The seat is supported in all the right locations.